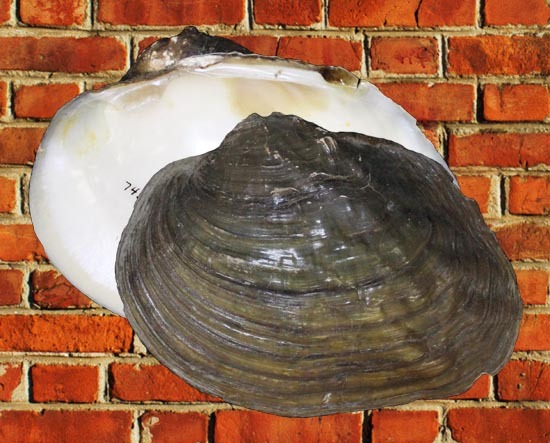 The September 2014 Mussel of the Month is Arcidens confragosus. Arcidens is a genus of two species in eastern North America. USNM 745596. Mississippi River, W shore at Red Wing [Goodhue Co.], MN. 17 July 1907! Arcidens confragosus came to our attention due to the recent article by Inoue et al. (2014). The authors employed phylogenetic analysis of nuclear and mitochondrial DNA as well as a morphometric study of shell dimensions to examine the evolutionary relationship between A. confragosus and Arkansia wheeleri. Inoue et al. (2014) found these two species to be sister to each other and the genetic divergence between them very shallow. They concluded that these two species should both be classified as sister species in the genus Arcidens. This affinity was pointed out in the original description of Arkansia (Ortmann & Walker, 1912), their congeneric status was codified by Clarke’s (1981) revision of the Tribe Alasmidontini, and we advocated such an evolutionary classification in our global checklist (Graf & Cummings, 2007; this web site). Given that no one has ever suggested that A. confragosus and A. wheeleri were anything but sisters (in the absence of molecular data, now available thanks to Inoue et al. 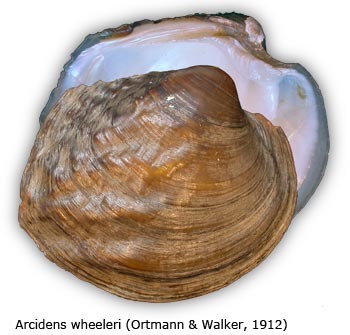 ), how is it that Ortmann & Walker (1912) felt A. wheeleri merited its own monotypic genus? The described differences were mostly conchological—A. wheeleri has a greater width, larger umbos and a different shell sculpture than A. confragosus. A. wheeleri also has a unique structure of the outer demibranch (Clarke, 1981). These are just the differences between two species. A priori, there is no basis to recognize (or not recognize) them as separate genera. Back in 2007, even in the absence of explicit phylogenetic data, we synonymized Arkansia with Arcidens (Graf & Cummings, 2007). This was not done based on any hypothesis about the level of divergence between them. Rather, we found it uninformative to have monotypic sister genera. If everyone agreed that A. confragosus and A. wheeleri was each other’s closest relative, then why wasn’t this reflected in the classification? No information is lost by classifying the two species in the same genus (i.e., the phylogeny has the same number of branches), but the evolutionary affinity between the two is made explicit by the classification. Clarke, A.H. 1981. The tribe Alasmidontini (Unionidae: Anodontinae), Part I. Pegias, Alasmidonta, and Arcidens. Smithsonian Contributions to Zoology (326): iii + 101 pp. Inoue, K., A.L. McQueen, J.L. Harris & D.J. Berg. 2014. Molecular phylogenetics and morphological variation reveal recent speciation in freshwater mussels of the genera Arcidens and Arkansia (Bivalvia: Unionidae). Biological Journal of the Linnean Society 112: 535-545. Ortmann, A.E. & B. Walker. 1912. A new North American naiad. Nautilus 25(9): 97-100.